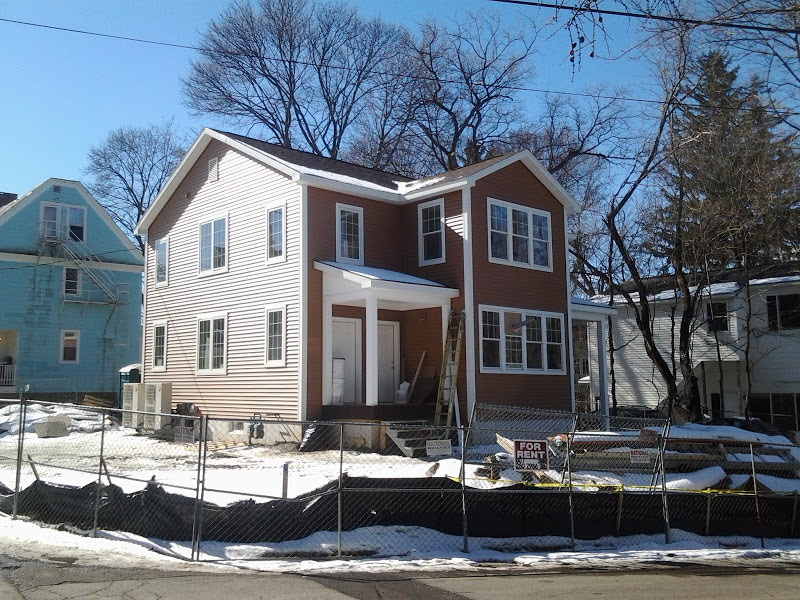 This small infill project in Ithaca’s Fall Creek is just about done. Tenants have already moved into the four three-bedroom units, and it looks like all that’s left on the outside is grass seeding and a coat of paint. According to the guys working on the duplexes, the mismatch in the second floor LP SmartSide wood siding was because the store they bought them (think they said Home Depot offhand) from had ran out, so they just bought what was available with the intent of painting over it when they were ready. It looks like the first floor has been painted, so that’s a good sign. It is nice to see that, although they were threatened for deletion if expenses came too high, the side windows on the inward-facing walls of the units (east side of 202, west side of 206) were retained. This is a small, unassuming project. It replaced an older single-family home with four units that fit in with the neighborhood. It’s a bump in density without garnering too much attention. To be candid, it’s probably the only feasible way to add density to Fall Creek – scout out the few vacant lots, or buildings with less historic or aesthetic value, and try to design something that fits in (the only other one I’m aware of is the Heritage Builders infill project on West Falls Street, but at this point it would need re-approval from the planning board). The three guys out front said that once these are complete, they expect to start work on developer Stavros (Nick) Stavropoulos’ next project at 107 South Albany Street. That site has not changed much over the summer, all that is there at the moment is the fenced-off foundation of the old building. The 11-unit apartment building slated for that site is expected to be completed by summer 2018. Another project making rapid progress in a short time. The two two-family homes at 1001 N. Aurora Street are being framed out. Going over the wood studs are Huber ZIP sheathing plywood panels, like all the cool kids are using in residential wood-frame construction. There are pros and cons to each approach. DuPont, in sales literature for its Tyvek Housewrap, touts easier installation, more durability during installation, and claims superior waterproofing. The ZIP system, however, has made significant inroads into the construction market because it does an excellent job at allowing moisture to escape while keeping external water from getting in, and although it requires a little more care to work with (taping), it’s still fairly easy to work with. ZIP panels also tend to be more expensive. 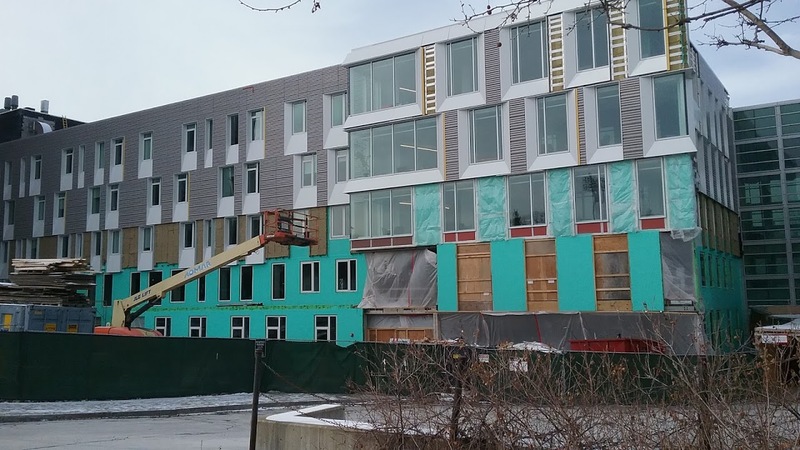 Liquid water-resistant barrier (WRB) sprays like the ones you see used on commercial buildings and at Cornell tend to provide the best waterproofing, but they are the most expensive option. So if one drew a scale weighing cost and performance, they could have housewraps at the low end of cost and relative performance, ZIP panels in the middle, and WRB sprays at the top. Anyway, these duplexes will be known as 202 Queen Street and 206 Queen Street. In the signage on the site, the bottom design is what was approved (quick tip – do not use old renders on signage). They replace a single-family home. Stavros Stavropoulos is the developer, and Daniel Hirtler the architect – the two are also behind the plans for the new 11-unit apartment building at 107 South Albany Street. This is another one of those modest-sized infill projects where if you blink, you might just miss it. 1001 North Aurora is on the north end of Fall Creek, across the street from the elementary school. The plan replaces an old though not especially historic single-family home with twom two-family homes, each unit with three bedrooms for a total twelve. Four parking spaces are included. The project was approved in October 2016 by the city planning board; the lot subdivision that triggered board review. 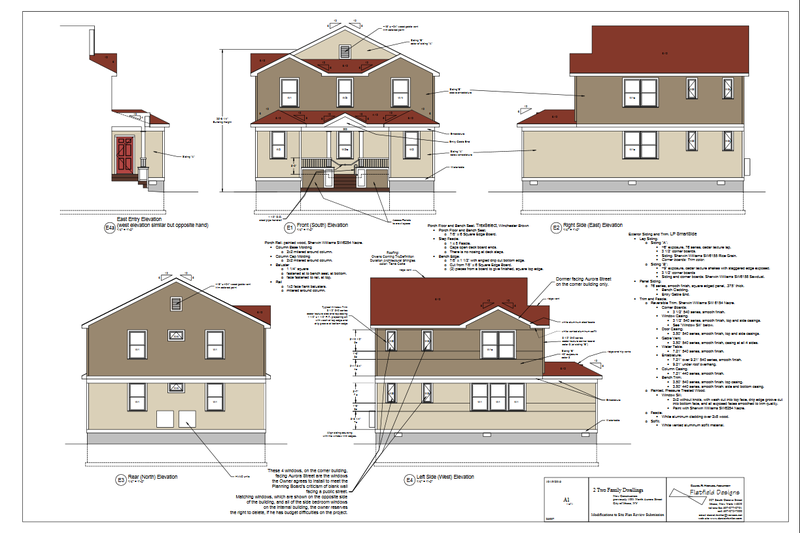 Over the course of review, the board requested a little more character in the house designs, including more windows, two different shades of lap siding (which will be LP SmartSide wood siding, painted Sherwin-Williams “Rice Grain” and “Sawdust”), and dormers. The materials also include Owens Corning TruDefinition “Terra Cotta” shingles and S-W “Nacre” trim boards. The initial design looked like this, and the final is shown below. The eastern building will not have the dormer, and may not have the pocket windows in the west wall either, as those were stated to be cost-dependent. The side facing Aurora, however, has to put them in as a stipulation of the approvals; after some recent issues with other projects, the board’s been getting a little more assertive when it comes to building details being built as approved. The developer is Stavros Stavropoulos. The Stavropoulos family is perhaps best known for running State Street Diner, but recently they’ve been wading deeper into the development pool, building a new two-family home at 514 Linn Street and a two-family addition onto 318-320 Pleasant Street. Tompkins Trust gave a $400,000 construction loan to this project back in August. You’ll notice in the photos below that the completed foundation slab sits a little above the ground – the northern part of Fall Creek has a high water table, so to help avoid water/flooding issues, the buildings are raised slightly. Wood framing is just beginning, so look for these to take shape as we finish out the winter and head into spring. Quick final detail – 1001 North Aurora Street was the old address. 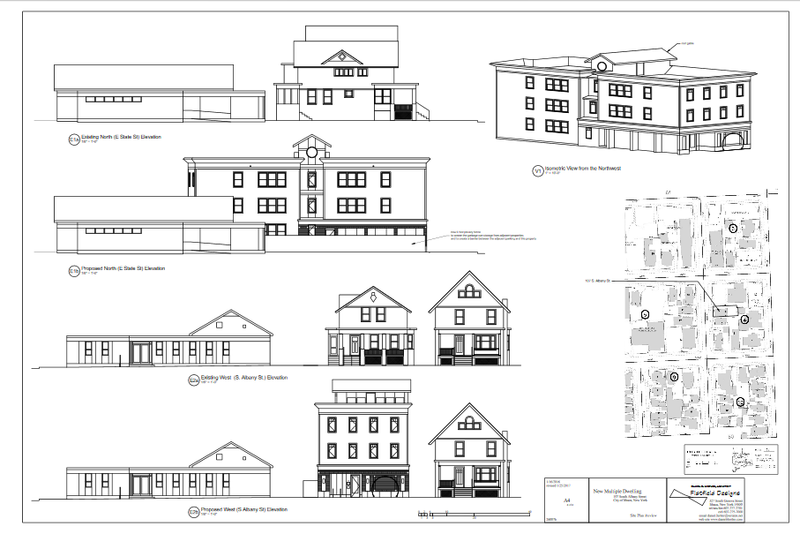 These properties will use addresses on the 200 Block of Queen Street.